Cyclists aren't always that adventurous in their choice of colours of cycling shorts and tights. When out on the road people go for black, or maybe dark blue. Certainly black is the colour of choice now, particularly as a few clothing companies like Rapha favour that colour scheme and it has proven popular. Personally, I don't agree with Henry Ford. I want any colour as long as it's not black! I would love to see something a little zany that can jazz up your ride and brighten the day for the beholder! Even something that will make passing motorists think, "what in God's name is that?!" At least there's no chance of them failing to see you! 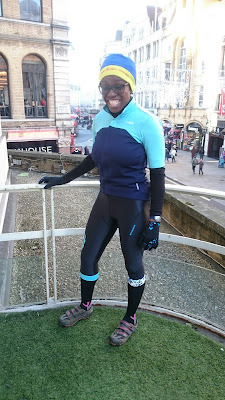 In the mean time check out these women's sportive three-quarter tights that I was given to test by Madison. Yes, they are black but they do have a nice sheen on them and there are a few little flourishes which make them stand out. I like the flashy design on the cuff of the lower leg. Madison have produced matching soft-shell gloves too with splashes of blues and purples. I wouldn't say the outfit is out and out zany, but it does depart a little from the whole plain black theme, and I like it. Worn with the windproof dhb Aeron Rain Defence short-sleeved jersey, the different blue shades make a great-looking combination. So that's the look - how about the feel? The pants are comfortable and have good flex for movement. Furthermore, they are warm and are fine for rides during these balmy temperatures we are currently experiencing. However, when we get properly into winter the ensemble would be better for fast-paced training rides or a race. As for the gloves, being showerproof and windproof with a fleece lining they are thick enough to still do the job, so even on leisure winter outings your ride is still jazzed up a little.